As many of you already know, I am moving to South Florida in a few weeks. It was a bittersweet decision because while we are thrilled to be moving closer to my family (and the Dolphins!) we are also sad to leave the city, our relatives here and of course, DolfansNYC. We are working on a new About Us section for our website, so I won’t go into the whole history of the club, even though I really want to. It’s honestly one of the things I am most proud of in my life. What this club has turned into is so incredibly awesome and I still look around on game days in disbelief at what it’s become. The fact that we have donated over $20,000 to charity in 7 years is nothing short of amazing. The fact that the Miami Dolphins organization has taken notice and are actively in support of what we do is incredible. The fact that we have turned MetLifeTakeover into a huge annual event that gives our team home field advantage in another city makes me so happy. All of this is thanks to you guys. For sitting with us in the cold in the 300 level section. For posting, tweeting, sharing, tagging and blogging about DolfansNYC. You guys have made this club what it is today and I couldn’t be more proud to be a part of such a remarkable group of fans. The rest of the league should be jealous. I will miss everyone so much and will forever look back on all of my wonderful memories of spending game days with my DolfansNYC family. 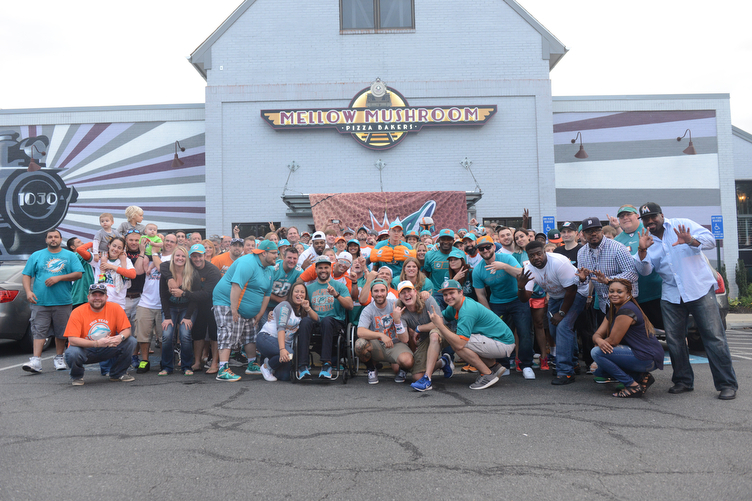 Last weekend I headed down to DC with a van full of Dolfans NYC members to support our brothers to the south. NOVA Dolfans and The Valley Finatics were doing their best #MetLifeTakeover impression in Washington called the DC Shutdown. After the NOVA Dolfans came to our takeover a few years ago they were really inspired and spent nearly two years planning this thing. Dolfans NYC did all we could to help them with this thing but they really killed it last weekend and I am glad we had a bunch of our crew there to support them. Saturday night there was a party at the Mellow Mushroom in Herndon, VA. It’s the NOVA Dolfans home base and although a hippie pizza place is an odd choice for a sports bar, it was a blast. Solo D did his thing and our buddies Paul Picken and Stephen Daniels hosted the event all night. Even OJ McDuffie showed up! It was great. The next day there was a huge tailgate but Dolfans were EVERYWHERE. DC only gets a Dolphins game every 8 years and it’s an easy drive from NYC all the way down to North Carolina. Ever Phins fan on the east coast seemed to be there and we actually ended up tailgating with a totally different crew because they let us use their grill (the NOVA guys had a catering company). Of course we still made our appearances and partied with those guys for a while. The game itself left a lot to be desired but in the end we got a win and Dolfans totally took over the game. The DC Shutdown crew was in one end and then all the Dolfans that bought tickets on their own seemed to be on the visitors sideline lower level. The combination of these to huge packs of Phins fans with the hundreds of other Dolfans there created a lot of noise and you could hear us clearly on TV. The whole thing was a blast. I thought I was going to take a ton of photos during the party and the tailgate but I ended up doing none of that. I did get a big group portrait at the Mellow Mushroom and a nice shot of my friend Kathleen doing a selfie with OJ McDuffie so I figured I would post those two shots but that’s really all I got. Anyway, see you guys on Sunday at 4pm at Slattery’s Midtown Pub! I can’t wait to get back to our bar! Phins up! Miami Dolphins own Branden Albert has partnered with St. Louis Ram’s DE Chris Long to raise money for Chris’ charity Waterboys.org. The charity raises money to build wells for clean drinking water in Sub-Saharan Africa. Aside from being an amazing cause, Chris Long came up with a great idea: If building a well costs $45,000 he could challenge one player from every NFL team to raise $45,000 and by seasons end they should hopefully have enough to build 32 wells. Branden Albert is in 7th place right now but I know Dolfans can do better than that! 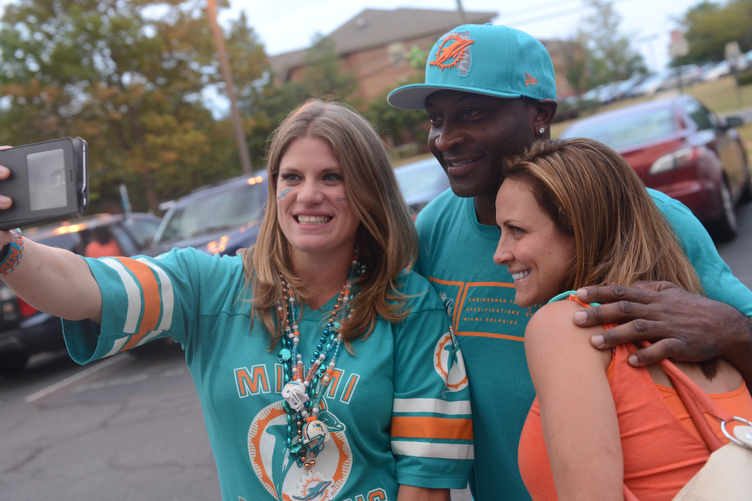 Let’s show everyone that Dolphins fans are the best fans in the NFL. 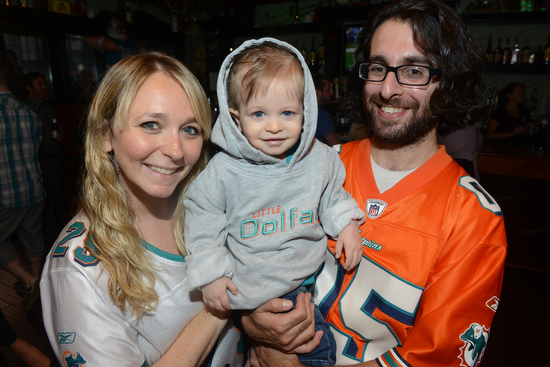 Dolfans NYC started things off with a $571 dollar donation but there is a long way to go! Donating should be it’s own reward (and it’s tax deductible!) but I figured we could sweeten the pot. Anyone who makes a $25 donation we will give a shout out and follow on Twitter or send some Dolfans NYC stickers in the mail or something. First person to donate $100 can have our 300 level season tickets to the home opener vs the Buffalo bills. Anyone else who donates $100 will get a $20 credit for Dolfans NYC merch to be used at Slattery’s Midtown Pub or the #MetLifeTakeover. Update: If you donate forward the confirmation to dolfansnyc@gmail.com. Thanks! Let’s help our Pro Bowl LT build a well! In unrelated news the fourth preseason game is no longer on national TV so we will NOT be doing an event at Slattery’s this Thursday but we will be ready to go for week one! See you at the bar!